Product information "Tin electrolyte (1000 ml)"
The Tifoo Tin electrolyte is excellent for tank and pen plating. This acidic electrolyte is free from cyanide and allows you to tin-plate yourself without any problems! A galvanic tin layer protects your workpieces made of iron and steel efficiently from corrosion and gives them a visually appealing surface with its very bright colour. As tin as metal isn't toxic, it is often used for crockery and tins to protect them from corrosion. Thanks to its good solderability, tin is perfect for printed circuit boards. The tin electrolyte is compatible with our complete galvanic kit. You just have to use our electrolyte with the graphite electrode and you will be able to tin-plate yourself quickly and easily. A perfect combination is using the rust converter and a following treatment wicht the tin electrolyte (pen plating). This will give the until then rusted pieces a bright white colour and make them look like new. 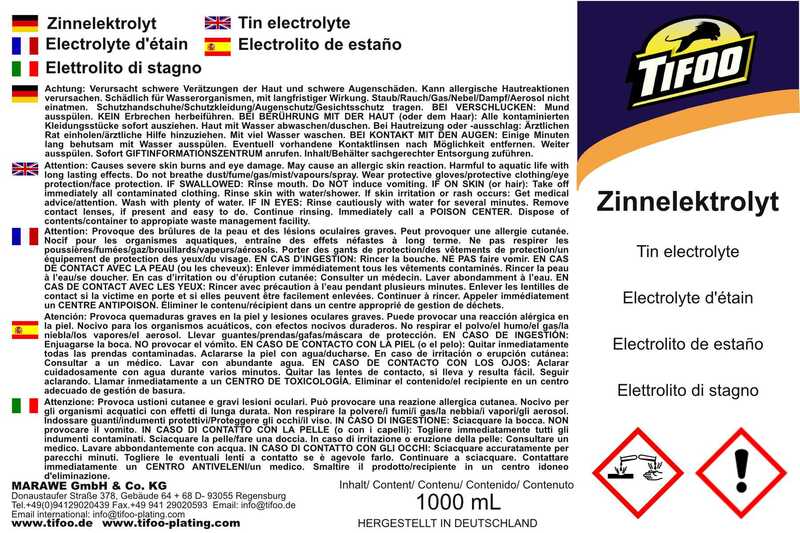 Related links to "Tin electrolyte (1000 ml)"
Instruction manual for Tifoo Tin electrolyte (1000 ml) as PDF file. Customer evaluation for "Tin electrolyte (1000 ml)"